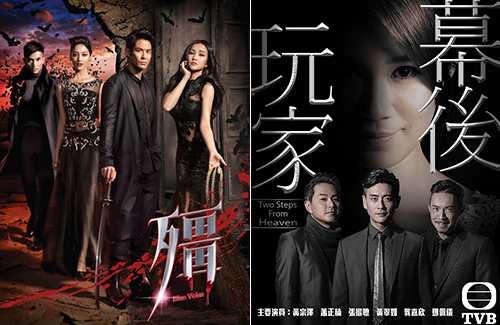 TVB promoted twelve of its upcoming television dramas for 2016 at the Hong Kong International Film & TV Market exhibition (FILMART) on March 14. Nearly 50 TVB artists attended the press conference to promote their respective dramas. As March 14 is White Day, the press’s attention naturally fell on the real-life couples. Edwin Siu (蕭正楠) and Priscilla Wong (黃翠如) were there to promote Two Steps from Heaven <幕後玩家>, while Kevin Cheng (鄭嘉穎) and Grace Chan (陳凱琳) were present to talk about their first collaboration, Blue Veins <殭>. Two Steps from Heaven stars Edwin and Priscilla as on-again, off-again lovers. Their relationship complicates when lead actor Bosco Wong (黃宗澤) starts a passionate affair with Priscilla. The trailer shown at the press conference included a clip of Edwin and Priscilla kissing on their wedding day, which then quickly cuts into a passionate kiss between Bosco and Priscilla inside a convertible. Bosco added that he was pleasantly surprised at how bold the script is, also expressing that he finds the subject matter of the show unique. Kevin and Grace’s love story in Blue Veins is less fortunate. In the fantasy show about vampires, Grace, who has unrequited love for Kevin, seeks to become a vampire for him. However, Kevin only has his eyes on her older sister, portrayed by lead actress Kay Tse (謝安琪). Well its okay to presume that tavia isnt there. Her last healer wasnt part of the promotion (Airing soon anyways.). Fingers crossed after the new changes in TVB she will stay! @yummiki24 Same here, really hope she’ll stay. Out of the 12 series, I’m only interested in Dinner at 8 (for Teresa, Power, and Wayne) and Law Dis-order (obviously for Uncle Chi, since I’m not fond of the rest of the cast for the most part). Also, as much as I love Roger Kwok, kind of tired of seeing him paired with Joey Mung in like every series, so not really interested in Dead Wrong at this point. If those 12 series are the ones TVB is planning to air this year, then looks like it will be yet another lackluster year with nothing much worth watching, IMO. With additional players entering the market this year, all the more reason to check out what they have to offer…. @llwy12 I know what you mean about the two real-life couples. Each time we hear about either of them, it’s always about their love life and as if we need to hear more, TVB showcases their love in events. Presumed Accidents seems quite interesting though I am not a fan of Sisley. There are also and Dinner at 8 and Law dis-Order. Liu Kai-chi has always been a good actor, love him in Justice Pao (TVB). TVB-series BLUE VEINS was partly shot here in Holland. Sadly I didn’t know the shooting schedule. Some people I personally know went to take a look at several locations. It must have been nice. Chloe Yuen Yee, one of the cast members, was born and raised in Holland. She used to be the assistant in the former TVB-programme MINUTES TO FAME with Hacken Lee+Joey Leung. I am interested in “Law Disorder”, “Dinner for 8” and “A Fist Within Four Walls:. I wish DF8 was not related to “Come Home Love”, but oh well, I like Teresa Mo so I’ll tune in for it any way. I am so happy that “The Last Healer” is airing soon. Have just watched the “Two Steps from Heaven” trailer and surprisingly it was quite interesting. Didn’t expect the dry plot could turn out that way. Still wish Tavia was a female lead instead of Priscilla though. However, Bosco and the other two men can make it work. Looking forward to seeing this show. Also, the Blue Veins…haven’t seen the trailer yet but a combination of Kevin plus Holland scenery plus interesting storyline works for me. So this drama is a must see for me as well. I’m actually excited for these series. The only ones I’m not interested in are 來自喵喵星的妳 and 哪吒與楊戩. So I’ll probably be skipping those. As for Dinner At 8 I really wish they’d drop the Come Home Love title. I’m a fan of the sitcom, but this a new show and it’s time to move on. No love for my Natalie Tong? 🙁 I’m really wondering why TVB doesn’t want to promote her. She’s a very capable actress IMO. She was also very good in Sunday’s stage fight show. Even Lisa Wang was shocked at how good she was and kept praising her.